Where Makita and Milwaukee target a smaller profile, Ridgid goes for power and takes first place in both torque tests. All of our hydraulic impact drivers claim to be quiet and Ridgid is 2 decibels quieter than any of the rest. If power and low noise are more important than weight, the Ridgid Stealth Force is the hydraulic impact driver for you. There are a few things that make me stop everything I’m doing, get up, and jump into a happy dance no matter who else is around. Ridgid just did that and I think David C. Smith is now threatening to put it up on YouTube. The source of my joy is the new Ridgid Stealth Force Brushless 18V 3-Speed Pulse Driver. With this move, Ridgid is again poising itself to move up the performance ladder by beating several other well-known brands to the punch. We were very impressed with the performance of the Gen5X 5-Piece Kit and the Gen5X Hybrid Fan – and that was before the new brushless tools started making their way on the scene. * Results as of February 11, 2019. Check out our Best Hydraulic Impact Driver page for updates as new models hit the market. The big deal with oil pulse drivers is the noise level and power. When someone is using an impact driver nearby, you know it. Even through several walls, the unmistakable pounding of the anvil can reach your ears. For maintenance and construction crews around schools, offices, and apartments, the noise level can be a problem. Oil pulse technology dampens the noise by using a hydraulic pulse to get the same more powerful benefits than an impact driver. Generations of industrial workers have known about the power of hydraulic tools and the oil impact driver has been around for a while. It’s just now making its way into the hands of general contractors and tradesman at a price point that can really be considered for an impact driver replacement. Until recently, affordable oil pulse drivers just weren’t available. Like the Gen5X Random Orbit Sander, the Ridgid Stealth Force is only the second to hit the mainstream market. Here’s the thing about Ridgid’s new oil pulse driver – it’s putting out fewer RPM’s and IPM’s standard impact drivers while boasting twice the driving speed and half the noise! Let’s look a little closer. The Ridgid Stealth Force (right) has a bigger footprint than the impact driver. Quantifiable data is tough to argue with and I wanted to test the claims of faster driving speed and lower noise. It was pretty clear in some initial tests that both were true, but how much better remained to be seen. I got out my Ridgid Gen5X Impact Driver (not the brushless one, but our review on that kit is coming soon!) to compare against the noise level and performance of the Ridgid Stealth Force. I grabbed a decibel meter running the dB(A) scale and placed it approximately the same distance away as my ear. Obviously, this is not a lab setting, so you might get slightly different results. The big thing is keeping the distance to the tool exactly the same. I started with a simple no-load running test on high speed. The Ridgid Gen 5X Impact Driver produced a consistent 85 dB(A) level while the Ridgid Stealth Force leveled off at 83 dB(A). That’s pretty much the last time the two tools were together on anything. This is the new RIDGID Power Tools Stealth Force oil impulse driver. Twice the speed and half the noise. Here's our first look: http://www.protoolreviews.com/tools/power/cordless/drills-drivers-cordless/ridgid-stealth-force-brushless-18v-3-speed-pulse-driver/19991/ Review coming soon! Although the difference in decibels is only 15, the implications are much greater. From perceived sound loudness, this means that the Ridgid Stealth Force Pulse Driver sounds about 75% quieter in our tests. Sound intensity is even more significant. The Gen5X Impact Driver has roughly 32 times the intensity of the Ridgid Stealth Force in our outdoor testing. Without hearing protection, you could continuously use the impact driver for just an hour and 30 minutes a day, but the Ridgid Stealth Force with no restriction according to OSHA specifications. When it comes to backing up the claim of greater driving performance, I tested the Ridgid Stealth Force Pulse Driver using 3-1/2” drywall screws and 3/8” x 3-1/2” lag bolts. 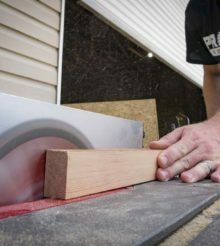 Both were used to connect stacked sheets of 3/4″ plywood and I gave the lag bolts the benefit of a 1/4” pilot hole. Since I was making some holes, I tossed in drilling data as well. Just to be fair, I used Ridgid’s 2.0 amp hour battery on both drivers. Starting with Milwaukee’s Titanium Red Helix Drill Bits that are designed for use with impact drivers, I drilled several 1/4” pilot holes that went through the plywood. The Ridgid Gen5X Impact Driver averaged 5.74 seconds. The Ridgid Stealth Force did the same number of holes with an average of 3.92 seconds each. This ends up being about 32% faster. With the lag bolts now up to the plate, their job was to fasten the material I just pilot drilled. The impact driver averaged 9.60 seconds while the Ridgid Stealth Force had a noticeably faster average of 5.54 seconds. For those of you with your scorecards out, that’s an improvement of 43% in speed. Finally, the 3” drywall screws had to make it through the same material without being aided by pilot holes. The Gen5X Impact Driver needed an average of 2.03 seconds for each drive. The Ridgid Stealth Force took just 1.29 seconds on average to improve speed by just over 36%. There are a couple of very important differences between traditional impact drivers and Ridgid’s Stealth Force Pulse Driver. You’re going to notice about half the number of impacts compared to an impact driver. Particularly when you’re driving slow, each impact transfers more power to your arm. You’ll get more wrist movement that makes delicate driving harder to control. You’d expect more transferred power into your arm and wrist to be harder on your joints. Even though your arm is moving more, it’s much softer than the vibration of an impact driver. This is due to the nature of having the oil pulse mechanism softening the more powerful blow internally. It feels like the difference between striking a hammer on a sheet of plywood versus 1/4” steel. You can deliver plenty of power in both situations. The wood cushions the blow and makes it feel softer even though you delivered the same amount of power. We’ll have to do some testing to prove it, but the softer blow may significantly improve the lifespan of impact rated driver bits. Industrial workers have understood the benefits of hydraulic impact power for a long time. We’re excited they are finally reaching the everyday user on residential and commercial jobsites. The Ridgid Stealth Force Brushless 18V 3-Speed Pulse Driver is more than just a quieter solution for apartment, school, and office jobsites. Its clearly higher driving performance makes it an easy choice to swap out for your traditional impact driver in nearly every application. There is a premium price on this as a kit. With 2 compact batteries and charger, it’ll set you back $199. The Gen5X Impact Driver with one battery is normally $99 but is currently on sale for $79. As these oil impact drivers, like the Ridgid Stealth Force, become more readily available, I’m hoping they’ll replace impact drivers in kits just like hammer drills have replaced drill drivers. Follow Pro Tool Reviews on Facebook and Twitter! This review originally published on December 23, 2015. It has been updated to reflect its performance in our impact driver shootout.